While fruit at the supermarket may look clean, think twice about sampling the goods before washing the skin. It's always best to wash your fruit before you consume it to ensure that you're getting the vitamins, minerals and benefits of whole foods without the pitfalls of dirty fruit -- such as the bacteria, pesticides and bugs that can linger on the surface. Think about all the hands that have handled your fruit before you purchase it at the store -- the harvesters loading the fruit into trucks, the grocery store worker who puts it on display, even the various customers who handle the fruit while choosing their own. 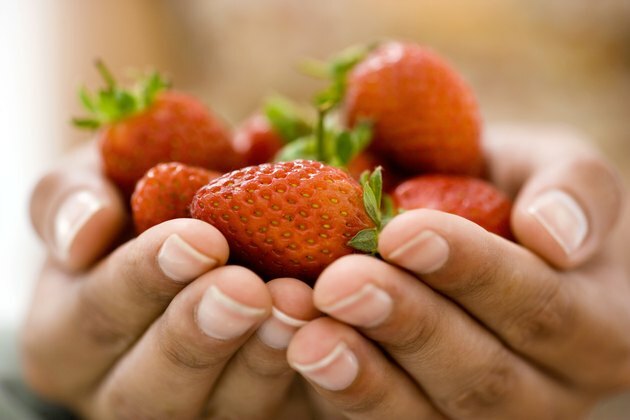 Each person has germs and bacteria on their hands, which is then transferred to the fruit. If one of those people were sick, you could absorb those germs when eating the unwashed fruit. By skipping the wash, you're putting your family at risk for illness. The Environmental Working Group released a list of 12 fruits and vegetables that were prone to having pesticides on the skin. Topping that list were peaches -- 97 percent of the peaches tested had traces of surface pesticides. Other fruits on the "Dirty Dozen" included apples, cherries, strawberries, grapes and pears. While the use of pesticides is strictly regulated by the Food and Drug Administration, continual exposure to and ingestion of a high amount of pesticides has been linked to health problems such as nerve damage and birth defects. Proper washing removes surface pesticides from your food. Certain fruits are especially prone to harboring bugs. While pesticides help get rid of these insects, if you choose organic fruit you may notice bugs and eggs. If your fruit has been purchased from a store or market where fruit flies are prevalent, the flies can lay eggs on the surface of the fruit. Washing your fruit properly before you eat it can help rinse away these eggs and kill the flies so you don't unknowingly ingest them. Even foods labeled "ready to eat" should be washed before consuming. While you can purchase so-called produce washes from the store, you needn't spend money on products. Instead, wash all fruit under running water for 60 seconds, using a vegetable brush on firm-fleshed fruit, such as apples or mangoes. If cleaning a soft-fleshed fruit, use your hands to gently cleanse the skin without bruising the flesh. For a more thorough clean, wash with 2 tbsp. of vinegar mixed with 1 pint water. Rinse with cool water and then allow to air dry before using.